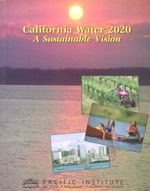 California Water 2020: A Sustainable Vision presents a unique vision of a truly sustainable water future and discusses way to realize this vision. Although originally published ten years ago, the report’s overall conclusion — that California water use is unsustainable and requires a new approach — is as true today as it was the day it was published. Although California has made progress towards improving efficiency and reducing the wasteful use of water, the state still wastes water in every sector of its economy (see “Waste Not, Want Not” for a detailed look at this issue) and has much work to do to ensure that there is enough water for people, bussinesses, agriculture, and the environment.